EOG Resources joint venture with ZaZa in the Eaglebine is moving into phase two of three. EOG is expected to complete the first three wells this year and was expected to elect into phase two in early 2014. Instead, the company has accelerated its plans. 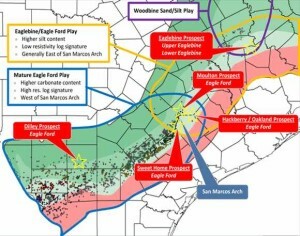 ZaZa also receives a 25% interest in approximately 19,000 net acres that have been acquired by EOG in exchange for $2 million plus additional acreage. ZaZa is assigning a 75% working interest in approximately 18,500 net acres in Walker and Madison counties. While two wells are still waiting to be completed, I believe this deal signals that EOG is confident in what they've seen from operated and non-operated wells in the area. There would not have been a reason to accelerate the timeline without an optimistic outlook. Watch to see if EOG elects into phase three later in the year or in January 2014. If they do, I believe we'll see the companies planning for development instead of exploration at some point in 2014.